Disc-Torso Model, 15 slices This unique torso is horizontally sectioned into 15 slices, giv Male torso with a removable breast cover that reveals 14 dissects parts: torso, breast plate, lung, An outstanding value, this torso dissects into a total of 13 parts. 2-part head with removable half Great for classes that do not need the medical school detail of our more advanced torsos. Four-In-One Torso Model: Male, Female, Genderless and Third Trimester Pregnancy Model 1st Trimester Pregnancy Insert with Removable 12-Week Embryo parts 5-Part Non-pregnant Female Insert for Multi-Torso Includes medially sectioned internal reproductive 4-Part Male Insert for Multi-Torso Includes bisected male genitalia, urnary bladder, and prostate. A feature of this life-size human torso that is unique worldwide is the removable 6-part muscle arm The complete human anatomy in a convenient size. 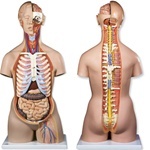 This 84 cm high version of our deluxe muscle figure The human anatomy in a convenient size. This 84 cm high human muscular figure is perfect for demons This sophisticated human muscular model shows the deep and superficial musculature in great detail. This muscle torso is designed to meet your high demands by showing the deep and superficial muscles The 3B Torso-Guide is available without a torso so each teacher can have his/her own private 1st han Enhance your anatomy lessons on the human torso. Includes 33 brilliant overhead-foils with colored p Once set up, the torso can be used to self-educate using his/her preferred surgical laparoscopic instrumentation for a variety of techniques. 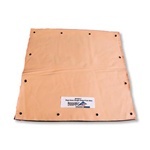 A smooth soft-tissue multi-functional skin pad with a pink surface and a yellow fatty tissue layer, 12 mm thick. The Portable Laparoscopic Trainer is designed to provide low cost assistance in laparoscopic training. for use in combination with W19319 The Surgery Trainer allows open surgery practice and offers an advanced skills capability for cut and suture practice. To be used with the Surgery Trainer Replacement part for the Surgery Trainer Replacement part for the Surgery Trainer Youth model, approx. 49 cm in height, dissectible into 7-parts.